Since 1996, eBay's feedback system has given users confidence to buy from unknown entities, and the Google Geeks have developed a system of their own that may help level the playing field for small sellers with whom shoppers may be unfamiliar. In a recent interview with AuctionBytes, Jerry Dischler (Group Product Manager for Google, responsible for Google Checkout and Google Product Search) and Tom Oliveri (Group Product Marketing Manager for Google, responsible for Google Checkout, Google Product Search, and Google Base) explained merchant reviews. Google Product Search displays merchant ratings that draw from Google Checkout shopper reviews as well as a crawl of third-party sites, including Shopzilla, PriceGrabber, Dealtime.com, NexTag.com, ResellerRatings.com, and even eBay's Shopping.com site. Google displays the merchant ratings in search results on Google Product Search (the tab is now called "Shopping") in the form of a 5-star rating that also indicates the number of reviews the merchant has received. Google lets users refine searches to limit results to listings from merchants with a certain level of ratings (5 stars only, for example). If you click on the star ratings for a particular merchant, you'll be taken to the reviews - and unlike eBay's system, Google lets users zero in on negative ratings exclusively - or on positive or neutral ratings as well. One source for the merchant reviews is Google Checkout, which lets shoppers leave reviews of their transactions. (Shopper identities are not revealed.) 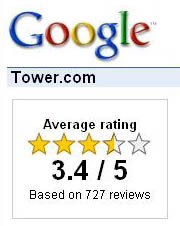 Each third-party site from which Google gathers reviews generally has its own rules about who can leave reviews. If you trust one site's reviews more than another's, Google lets you go right to that site (PriceGrabber, for example) and read only those reviews for the merchant with whom you are interested. Google does not reveal the algorithms it uses to determine the order in which it displays merchants. Currently, it appears that larger merchants dominate the first page of search results on Product Search. But Google lets shoppers slice-and-dice in many ways. For example, at the bottom of the search results pages, you can click a link to see all stores that have results for your search. It's not clear how important Google's merchant reviews are to shoppers, but it's certain Google is tracking this data. A recent AuctionBytes survey revealed that customer ratings made respondents confident about purchasing from a site they had not heard of before. This suggests it may be worth a merchant's time to monitor the reviews they are receiving across the Internet, not just on marketplaces such as eBay and Amazon, particularly with the increased exposure these ratings now receive on Google Product Search.